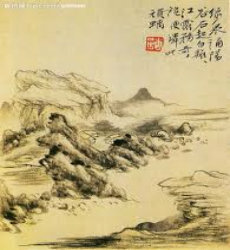 Autumn Water (秋水, Qiu Shui , Guqin, 古琴) is also known as Shenhua Yin 《神化引》 (“Becoming an Immortal” or “Metamorphosis”). The melody is based on Zhuang Zi’s story of dreaming he was a butterfly and questioning whether he was dreaming of the butterfly, or was the butterfly dreaming of him. This piece has a feeling of emptiness and transcendance of emotion. It is what is called ‘dan’ or tasteless, plain, pure, without embelishment and captures the moment when one becomes a celestial being, removed from worldly pleasures and desires.